Eyebrows have become THE hottest beauty trend since teeth whitening. And it’s no wonder – they frame the face and have a way of giving that polished look to your overall appearance. But what if you weren’t blessed with naturally full and perfectly shaped arches?? 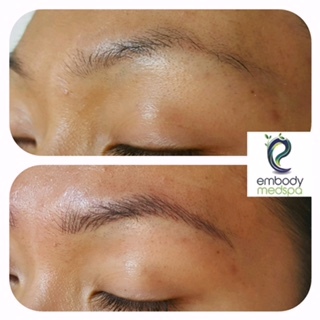 Microblading, a new form of semi-permanent makeup, will turn even the most pathetic brows into gorgeous works of art. Also known as eyebrow embroidery and feathering, this procedure is used to reconstruct lost eyebrows, re-build thin brows, or just enhance existing brows. The best part? It looks completely natural and lasts up to 18 months! 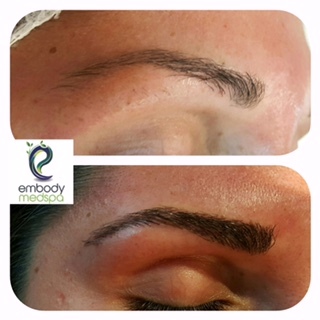 Unlike traditional cosmetic tattooing, microblading uses individual strokes to create realistic-looking “hairs”, as opposed to blocks of color. Our highly skilled and certified microblading technicians carefully map out the perfect eyebrow shape and customize the color using only the finest non-toxic, stable, insoluble, and antiseptic pigments. 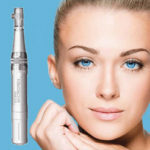 A non-motorized tool called a microblade scratches the outer layer of the skin which then allows for these specially developed pigments to be absorbed. The whole process t akes about 2.5-3 hours and voila! Realistic, flawless brows that won’t wash off or smudge or fade away. While microblading may not be for everyone, it is a truly amazing breakthrough in the cosmetic industry. So maybe you’re sick of filling in your wispy brows or tired of drawing on new ones each morning. Or maybe you just want your arches to be the envy of all who see them. 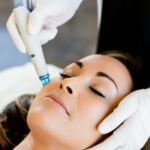 Whatever the reason, microblading might just be the treatment you’ve been searching for.